Pilonidal disease can be treated by less invasive methods such as simple mechanical cleansing of the sinus and cavity of hairs and granulation tissue eventually supplemented by filling the space with an antiseptic or sclerosing agent like phenol (forbidden in Germany due to its toxicity) or space-holding fibrin glue. Minimal excision or debridement of the sinus and/or cavity through a midline or a separate paramedial excision can also be performed, leaving the wounds open or closed. These methods are simple and cost-efficient, and associated with low pain, rapid healing, and a rapid return to normal activity. A disadvantage is the higher recurrence rate; however, these methods can be used repeatedly for recurrences. Whereas the evidence for treatment with phenol or fibrine glue is weak, there are numerous reports supporting the safety and efficiency of the minimally invasive surgical methods. Because of the associated low risk for complications and morbidity, these procedures are suitable for first-line treatment in the majority of pilonidal disease patients. Ein Pilonidalsinus kann mit weniger invasiven Methoden behandelt werden, z. B. durch die Reinigung des Sinus und der Entzündungsgänge von Haar und Granulationsgewebe und anschließende Füllung des Hohlraums mit antiseptischen oder sklerosierenden Medikamenten, wie Phenol (in Deutschland wegen seiner Toxizität verboten) oder Fibrinkleber. Diese Verfahren sind einfach und wirtschaftlich und gehen dabei mit geringen Schmerzen, schneller Heilung und schneller Rückkehr zur normalen Aktivität einher. Auch kann eine sparsame Exzision oder ein Débridement durch eine separate paramediane Inzision erfolgen. Ein Nachteil ist die höhere Rezidivrate, aber diese Methoden können mehrfach und auch bei Rezidiven erneut angewandt werden. Zwar ist derzeit der Literatur kaum ein Beleg zur Unterstützung für die Therapie mit Phenol oder Fibrinkleber zu entnehmen, jedoch finden sich zahlreiche Arbeiten mit Belegen für die Sicherheit und Wirksamkeit der minimalinvasiven chirurgischen Verfahren. Wegen des niedrigen Risikos für Komplikationen und Morbidität sind sie zumeist für die Erstbehandlung bei Pilonidalsinuserkrankungen geeignet. Minimally invasive surgery for pilonidal disease is simple, safe, and cost-efficient, with low morbidity, rapid healing, and a rapid return to normal activity. Although recurrence rates seem high at first glance, the procedures can be successfully repeated for recurrences, achieving healing rates of over 90% for 1–2 interventions. Future well-designed trials are necessary to aid patient selection. An ideal treatment for pilonidal sinus disease (PSD) should be simple and cost-efficient, and associated with low pain, rapid healing, a rapid return to normal activity, and low recurrence rates. None of the available methods can fulfill all of these criteria. Although the less invasive methods for treating PSD fulfill almost all the above-specified criteria, they may have higher rates of recurrence. However, the methods should not be evaluated by a single outcome measurement; all methods have pros and cons that should be weighed up together. A higher recurrence rate may be acceptable if the other criteria are superior. Because of the lower resource consumption—no need for general anesthesia, outpatient management, short time until full recovery, and the lower risk of troublesome wound complication—the less invasive methods are particularly indicated for patients with limited disease and are also worth trying as first-line treatment in patients with more extensive disease . Weaknesses of most reports on the less invasive methods are a retrospective design, lack of control group, insufficient description of disease severity in patients selected for the treatment, short follow-up, and an unclear distinction between non-healing and recurrence. Simple mechanical cleansing of the sinus and cavity is the least invasive conservative treatment. It is probably the first line of treatment in many institutions, particularly in cases with less extensive disease. Cevik  treated 29 patients by removal of hair nests and filled the cavity with an antiseptic solution. Antibiotics were given for 10 days. The area was kept free from hairs by weekly topical wax agent until healing. The author reported 79% healing at a mean of 8 months follow-up. Phenol and fibrine glue have been used as topical treatment. The aim is to achieve obliteration of the sinus and cavity through sclerosis. The fibrin glue may also work as a space-holding agent, which may improve healing by reducing infection and the associated inflammation. Treatment with phenol has been analyzed in two systematic reviews based on 13 reports in 2009  and on 14 reports in 2017 . Kayall found an overall success rate of 87 ± 10% with a mean follow-up of 2.0 ± 1.1 years . The most common postoperative complication was abscess and cellulitis (in 8.7%) due to leakage of phenol into the surrounding tissue. Emiroglu doesn’t include a summary estimate of the outcomes . The studies included in these reviews show large heterogeneity, with reported success rates ranging from 60 to 100%. One prospective randomized trial compared phenol treatment with excision and open healing in 140 patients . Phenol treatment was associated with less postoperative pain and a shorter time to resuming daily activity, but no difference in recurrence rate (19 and 13% at 38 and 42 months follow-up, respectively). Phenol is forbidden in Germany due to its toxicity and possible teratogenic effects. The use of fibrin glue for pilonidal disease was analyzed in a systematic review of 5 reports including 85 patients in 2011 . Four of these reports used fibrin glue as an adjunct to surgical excision. Only one study  used fibrin glue as monotherapy after simple curettage of the pits in 8 patients. This was essentially a pilot study reporting one recurrence at 6 weeks follow-up. A Cochrane review identified one unpublished study that evaluated fibrin glue as monotherapy compared with Bascom’s procedure, and three studies using fibrin glue as an adjunct to surgical treatment with flaps . 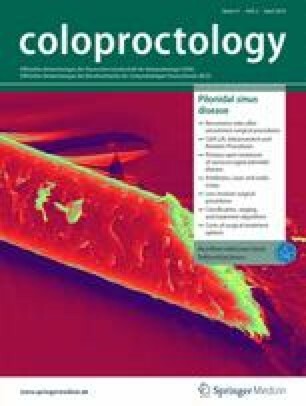 They concluded that “Current evidence is uncertain regarding any benefits associated with fibrin glue either as monotherapy or as an adjunct to surgery for pilonidal disease.” Three retrospective reports have been published on a total of 183 patients, with recurrence rates between 2 and 26% [8, 9, 15, 25]. Lord and Millar first described this method in 1965. All pits are excised down to the underlying cavity through small separate incisions, removing as little of the normal skin as possible. No attempt is made to remove the cavity. The cavity is cleansed of hairs using forceps or a tiny bottle brush with nylon bristles, and the cavity is mopped clean of granulation tissue. The wounds are left open for healing by secondary intention. Gips popularized this method by using trephines instead of a scalpel for the excision. Results of the Lord and Millar/Gips technique in over 7000 patients have been described in 9 reports [4, 7, 11, 18, 19, 22, 28, 30]. The reported recurrence rates vary from 3 to 28%, with around 25% in the larger studies with longer follow-up. Two reports used fibrin glue to fill the cavity as an adjunct to the Lord–Millar technique in 18 patients [24, 25]. Bascom used a similar variant of this technique, called Bascom Pit Picking or Bascom I. Beside excising the sinuses through small separate excisions, he made a complementary incision lateral to the midline, through which he removed the inflamed tissue from the cavity and its eventual capsule. The midline wounds were closed and the lateral incision left open for drainage. Results from this method have been reported in a total of 418 patients in 6 studies [1, 2, 6, 13, 14, 23]. Recurrence or incomplete healing is reported at 24 to 29%. Soll has described a third minimally invasive surgical technique. The orifices and sinuses are excised with a minimal margin and the cavity is dissected en bloc with the sinuses through the small openings resulting from the excision of the sinuses and orifices. The wounds are left open for secondary healing . An estimated recurrence rate of 7% at 5 years follow-up was reported in long-term follow-up of 257 patients . One issue with the limited excisions is the second-intention wound healing. The median time to wound healing is about 25 days in most studies. However, delayed healing may occur in about 10 to 16% [4, 6, 11]. Khodakaram  described a modification of the Lord–Millar method where the wounds from the small midline excisions were closed primarily (Fig. 1). This shortens the time to wound healing substantially. Whereas the recurrence rate may seem high, it should be noted that the same method can be used repeatedly with similar results, suggesting that over 90% can be healed with 1–2 operations [17, 18, 30]. Both phenol treatment and fibrine glue may have an effect in selected cases. However, their role in the treatment armamentarium remains unclear, as the available studies are small and mainly retrospective, with an unclear disease severity in the included patients, lack of control groups, short follow-up, and heterogenous results. Phenol has a disadvantage because of its more complicated application as well as its toxicity and corrosive properties, which may explain the rather high risk of postoperative infectious complications. The mechanism of fibrine glue is probably not as a sealant but more as a space holder to fill the dead space, which may impede infection and its associated inflammatory response . There is quite a large body of evidence supporting the safety and efficiency of the minimally invasive excisional methods. As the same methods can be successfully applied repeatedly in case of recurrences, they have a clear place in first- and even second-line treatment. There is currently insufficient information to guide selection of the superior method, indicating a need for randomized trials. These should include some means for grading the severity of disease and defined endpoints. We also need to identify factors associated with good or bad long-term results to help in selecting the right method for the specific patient. Future studies are also indicated to refine the technique. Particularly improvements to lower the recurrence rates should be investigated. Does the cavity need to be excised? May fibrine glue play a role as an adjunct? Minimally invasive excisional surgical methods are simple, safe, cost-efficient, and have low morbidity, assuring rapid healing and return to normal activity. 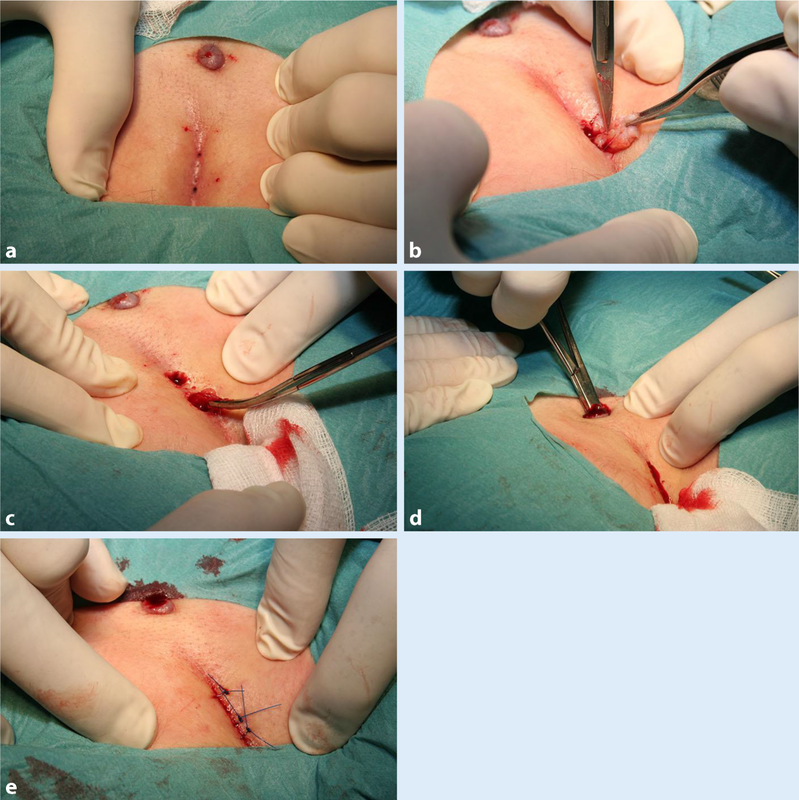 The recurrence rates may seem high, but the same technique can successfully be applied repeatedly in case of recurrences, achieving a healing rate of over 90% with 1–2 operations. This supports the notion that these methods should be used as first- and second-line treatment in view of the higher costs and risk of troublesome morbidity associated with more extensive surgical methods. R. E. Andersson declares that he has no competing interests.